At North Shore University Hospital, signs remind visitors of hospital quiet hours that run from 9:30 p.m. to 5:30 a.m., during which voices are kept low, cell phones are silenced and nurses bundle care in order to disturb patients as little as possible. North Shore University Hospital (NSUH) has announced the launch of its “Quiet at Night” initiative, a far-reaching set of new protocols and priorities designed to silence extraneous noise in an effort to allow patients to rest and heal. The move makes NSUH the latest of Northwell Health’s hospitals to roll out the nighttime practice, which will be adopted systemwide by the end of the year. “Quiet at Night” addresses a hospital noise problem that is familiar to anyone who has been an admitted patient or visited one. Patients sleep about 80 minutes less each night in the hospital than they typically do at home, in large part because of noise and awakenings by staff, according to a recent study in the Journal of the American Medical Association Internal Medicine. Other studies have linked excess noise and sleep deprivation to a number of negative outcomes for patients, including an increased risk of delirium, higher blood pressure, a greater use of pain medication and delayed healing. 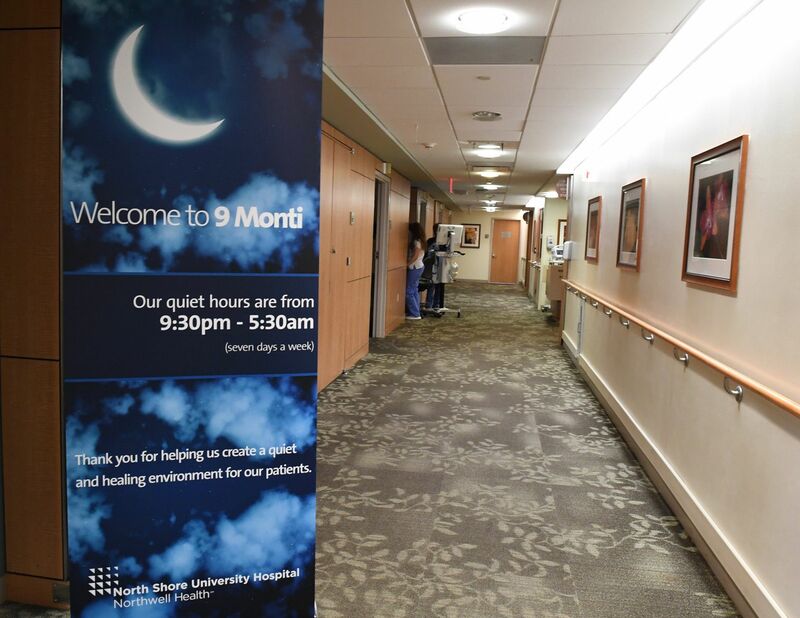 To reduce the damaging impact of noise, NSUH’s “Quiet at Night” initiative establishes hospital quiet hours that run from 9:30 p.m. to 5:30 a.m. As this period begins, an overhead announcement notifies visitors that patients may be trying to sleep, cuing them to keep voices low and minimize disruption. Hospital staff members also follow a special protocol during quiet hours, dimming lights, silencing phones, closing patients’ doors when appropriate, and bundling care as much as possible to reduce the need to disturb patients. Staff will also offer amenities such as eye masks and earplugs, as well as headphones for those who wish to listen to music or the television without disturbing a roommate or neighbor. North Shore University Hospital and other Northwell facilities adopting “Quiet at Night” have also instituted night councils – led by workers with night-shift experience – to identify and address structural or procedural issues that increase environmental noise, such as squeaky doors or avoidable late-night deliveries.